Footwork, body position and ball handling skills are all important factors when it comes to passing accurately. These passing technique drills and videos will develop your players' range of static and moving passing skills by guiding them through drills for both individuals and pairs. 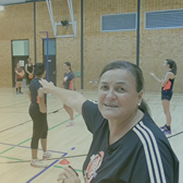 The drills and videos will boost your player's ability to perform the 1 handed, 1 step, behind the back, under shoulder, bounce, chest, javelin, hook and flick passes.